October 18, 2017 Emily V.
When it comes to closet staples you can't beat a classic white button-down shirt. It's a wear anywhere item that can be dressed up or dressed down. You can opt for varying styles from full button-down or a popover style (like the one I'm wearing) and can find them in a variety of fabrics from silk to the classic crisp cotton. It's one of those pieces that when you don't know what to wear, you can rely on this shirt to answer the question. From denim to trousers to skirts to shorts, it'll be hard to find something that this shirt won't pair well with. 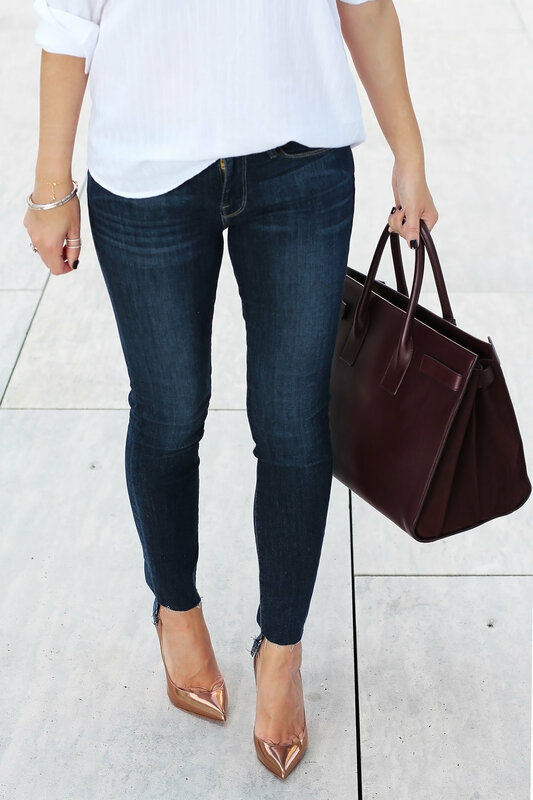 I prefer to keep the look classic and pair a white button-down with dark denim and heels. Alternatively, it can be easily dressed down with a pair cute sneakers and a baseball cap.